A group of University of New South Wales (UNSW) Sydney academics have formed a partnership with Makerere University in Kampala, Uganda, to train optometrists and transform access to eye care services for thousands of people affected by poor vision. 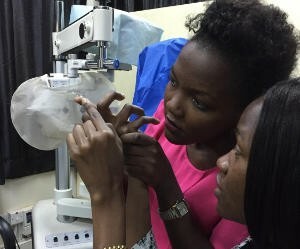 The team, led by Associate Professor Isabelle Jalbert and Dr Kathleen Watt from the School of Optometry and Vision Science, will oversee the training of local optometrists, the creation of specialist eye health programs and curriculum development for the first optometry degree ratified in Uganda. The team from UNSW Science, supported by UNSW’s Institute for Global Development, will spend the next year visiting Makerere University to teach students and support the faculty, particularly in specialised fields of advanced contact lenses training, binocular vision, paediatric optometry, and ocular diseases. “Our team will travel to Uganda four times this year to teach through practical workshops and provide online training material that students can access outside of the visits. The optometry faculty at Makerere University is in the process of being built up and is very stretched in covering all the teaching required,” says Dr Jalbert. The School of Optometry at Makerere University is a collaboration between UNSW, the Brien Holden Vision Institute, Australian Department of Foreign Affairs and Trade, Optometry Giving Sight, Light for the World, and the Optometrist Association of Uganda. The first group of Ugandan-trained optometrists graduated from Makerere University in January. Uganda is one of the African countries supporting optometry as a public health priority to address the growing need of uncorrected sight. Training optometrists locally in Uganda using internationally developed teaching materials and advanced equipment will help ensure the population receives basic services including prescription eye glasses, eye exams, contact lenses and prevention and detection of eye disease.